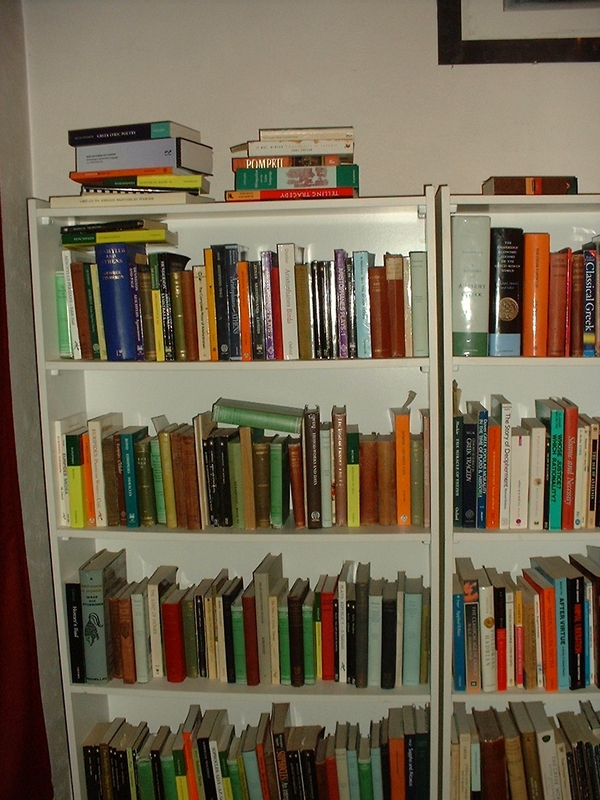 This posting is about my experience of buying books on classics-type subjects (Ancient Greek language and literature; Indo-European; the Hebrew Bible–Latinists had better look away now), in the hope that they will prove useful to other people. As ever, there are two ways of buying these books: on the Internet and in person. This is really pretty easy, since a great deal can be found through BookFinder. This covers all kinds of things: Internet retailers of new books, Internet second-hand dealers, the Internet arms of conventional booksellers–and many different countries besides. It’s worth noting that it may be cheaper to order books from the American or German versions of Amazon than from the English one. As to sources that are not on BookFinder, the Hellenic Bookservice have their own catalogue (they do Latin as well, but their online catalogue only covers 35% of their stock). And Oxbow Books only seem to have data from the American website listed on BookFinder, so it’s as well to visit their own site as well. In the past, I’ve also bought some of the Bryn Mawr commentary series directly from Hackett Publishing in the US, though they seemed not to be sending outside the US and Canada when I last looked. Also see the recommendation below for anybook.biz–I’ve never used them myself, so I’ll have to have a go. Apart from those mentioned above, sources I’ve found useful include Marijana Dworski (languages) and Pendleburys (theology). 4. if you can’t find it anywhere, you can always leave a want on sites like abebooks and they’ll email you when it turns up. You also get some interesting classical books appearing in Italian from time to time–see here for an example. In London, Waterstone’s Gower Street have a reasonable selection, as do Foyle’s. The Blackwells in Charing Cross Road doesn’t have much, but their shops in Oxford and Cambridge do. You can generally use the website to find out which branch of Blackwells has a particular book in stock. As well as Blackwell’s, there’s also the Classics Bookshop to be found in Oxford–well, somewhere in the Oxfordshire countryside nowadays, to be precise. Moving into the second-hand/remainder area, the Gower Street Waterstone’s has a reasonable amount of highly-priced used stock, while Skoob have a (often quite substantial) selection of Loebs and some other stuff, and the same goes for Judd Books. We may also add Unsworth’s in their new home in St Martin’s Court. Then again, Henry Pordes Books quite often have something interesting (but very few cheap Loebs). And there’s always the Hellenic Bookservice! The definitive editions of the Tanakh (Hebrew Bible), Septuagint (Greek translation of the Tanakh), Vulgate (Latin version of the Bible) and Greek New Testament are those published by the Deutsche Bibelgesellschaft. It’s worth having a look on their website, since these editions may be more available or cheaper there than on Amazon/via the normal channels. You’ll need to use the Latin versions of the titles: Biblia Hebraica, Septuaginta, Vulgata, Novum Testamentum Graece. However, I don’t think that Bookfinder covers anybook.biz, who seem to get most of the books ill-advisedly chucked out by UK universities. That’s where I always start.